Nazand Begikhani was born in Iraqi Kurdistan, 1964. Living in exile (Denmark, France and later UK) since 1987. First degree in English language and literature. Then, MA and Ph. D in comparative literature at the Sorbonne University, France. Published her first poetry collection, Yesterday of Tomorrow, in Paris, 1995. Her second collection, Celebrations, Aras publication, came out on April 2004 in Iraqi Kurdistan. Her third collection which is a collaborative work with a famous Kurdish poet Dilawer Qaradaghi and called Colour of Sand will be out in summer 2005 in Iraqi Kurdistan. She is a polyglot and self-translates her poetry into French and English. Many of her poems are published in French, Arabic, Persian and English. 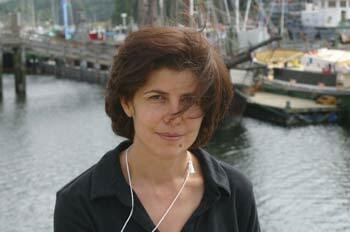 She is also a translator from French and English into Kurdish; she translated Baudelaire and Eliot into Kurdish. A part from writing poetry, Nazand is an active researcher and advocate for women’s human rights. She is the founding member and co-ordinator of the network organisation Kurdish Women Action against Honour Killing (KWAHK). Her researches on Kurdish gender are widely published in Kurdish, but also in French and English. She worked as cultural programme organiser at the Kurdish Institute in Paris, then in the Kurdish Cultural Centre in London. Between October 2000 to late 2001, she was the editor of RAM Bulletin (Refugees and Asylum Seekers in the Media) at the Press Wise Trust in Bristol. She is currently sub-editor at BBC Monitoring.